During my one week bike ride in Thailand, we stayed at several hotels, usually the best one in town. Our hosts carefully selected these hotels for us. We spent only 1 night in each and I didn't book or pay for these hotels, hence it is difficult to write full review. I haven't stayed in these towns earlier, so don't have any other hotel to compare with. Hence in below post, I am sharing quick observations made at each of these hotels and resorts. Nice hotel with close to 16 floors. Internet was weak but worked. Bathroom slippers chargeable. Waiting for lifts were tricky, as we wouldn't know which lift is in which floor and which one is catering to our call. Only after it arrives, we would know that. Nice little resort little away from town. Turn from the main road is easy to miss. My room was the smallest of all hotels during our trip, but I understand there are other bigger cottages which are spacious. Campus is green with lots of open space and trees. A small water stream also flows by. In a strange positioning of cottages and security guard's post, when someone walks into the resort, my room came first and then the security post, while it should have been other way round. Breakfast had limited options, but adequate. The rooms are built in a small part of the property, in a somewhat hexagonal manner. This resort had the most spacious room of all hotel rooms I'd ever experienced so far. A small stream of water surrounds the resort all across. Most of the hotels offer either a bath tub or a shower area. Huenkamfah resort's bath room has both. The trays were made using bamboo and I liked that. If you're going with little kids, opt for a room in ground floor. This is because the support walls are not tall enough and playful little kids run the risk of toppling over, if careless. During check out, I asked counter staff about the room rent and other details. She asked me to refer their facebook page instead. I could not locate Huen Kam Fah resort on facebook. However other internet literature indicate that this resort costs 1500 THB onwards per night. Wi Fi was manageable inside the room, good only in reception area. Their golf course is not yet ready. There're a few friendly cats in the resort (and a few not so friendly dogs too), one authoritatively walked into my room and rubbed its neck against my leg, demanding I pat it. 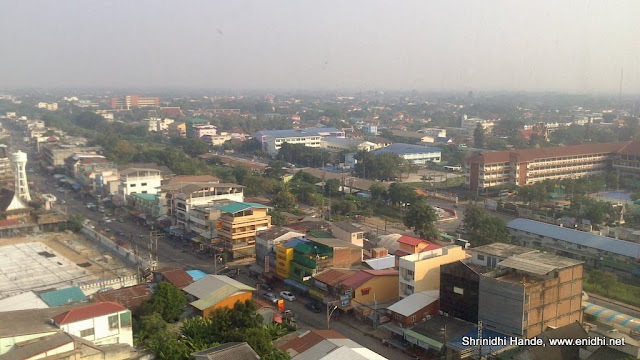 Topland is one of the most popular hotels in town and with its 16 floors, offers great view of Pitsanulok. Very close to various intercity highways and a popular temple- Wat Rattana Mahathat Phra Buddha but slightly away from most happening streets of town. Post 9 PM there aren't much shops open around the hotel. But cycle rikshaws/taxis available outside the hotel. Hotel building also has a mall and a convention centre. View from the room was nice, but the mesh spoiled clear view. The housing arrangement looked as if I am in Europe. Neat, clean and good looking. There was a tower, tried to find out what it was, but couldn't get detailed answers. The tower had lighting at two levels- probably a communication tower. Learnt later that it is a watching tower in Suphanburi. Room was nice and decent. 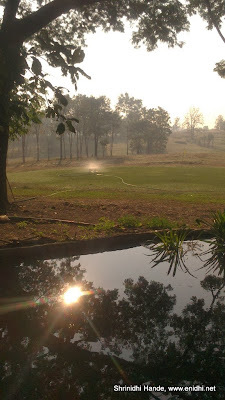 Day 6: River Kwai Bridge Resort, Kanchanaburi, Thailand. Probably the best place to stay so close to the historic river kwai bridge. River Kwai bridge resort has a set of independent cottages (no river view from the cottages, as they are aligned perpendicular to the river) and a river view restaurant. Part of river Kwai bridge is visible from the resort and we watched the annual river kwai memorial celebrations from the restaurant. Cottages were less spacious compared to other hotel rooms reviewed above, but there's no complaining. River Kwai Bridge and museum are walkable from the resort and world war memorial in Kanchanaburi is 2 kms from the resort. They have 2 cycles which reportedly guests can use. But because of language problem I couldn't avail them. Trying to communicate the staff that I wish to take their cycle resulted in a difficult expression and some verbal communication which effectively meant I can't have it. Reportedly owner of the resort is also a bike enthusiast. Nice reviews. In fact, each hotel/resort had a charm of its own. This is very informative blog and i got very informative knowledge from this blog.Please keep it up posting. Skydiving in India-is it expensive? Open ATMs- Safer ATM design? T-mart cyber monday special deals!